Here are a few more popular recipes from the past. The Flounder recipe is one we like a lot. Place the ground beef in a medium bowl, breaking it up as you do. Sprinkle the Worcestershire sauce, steak seasoning and parsley over the beef. Add the breadcrumbs and cream. Mix gently. Divide the seasoned ground beef into 4 even portions and form into patties. Place a large skillet or saute pan over medium high heat. When hot, add the 2 teaspoons of oil and swirl to coat the pan. Add the burger steaks and cook for approximately 3 minutes per side. Remove the burger steaks from the pan to a plate and cover loosely with foil. Season mushrooms with salt and pepper, to taste. Saute the mushrooms in the same pan as the meat, until brown, about 5 minutes. Add butter, the onion, thyme and garlic. Cook until vegetables are soft, about 5 minutes. Whisk in the flour. Add broth, slide meat back into sauce, cover and simmer until tender, about 30 minutes. Melt 4 tablespoons butter with the olive oil in large skillet over medium high heat. Dip fillets in flour then in beaten eggs. Add the fillets to the skillet and cook until browned and just cooked through 2 to 3 minutes per side. Transfer to serving platter, keep warm. Melt the remaining 1 tablespoon of butter in the same skillet. Add the almonds and cook until heated through about 1 minute. Add wine and lemon juice and simmer until thickened, stirring constantly. Pour the sauce over the fish. Garnish with lemon wedges and serve. Heat the oven to 375°F. Line 15 x 10 x 1 inch pan with parchment paper. Coat the paper and pan sides lightly with cooking spray. In a medium bowl, beat eggs with an electric mixer on high-speed about 5 minutes or until very thick and lemon colored. Gradually beat in the granulated sugar. Beat in water and vanilla on low-speed. Gradually add flour, baking powder and salt, beating just until the batter is smooth. Pour the cake batter into the prepared pan, spreading to the corners. Bake 12 to 15 minutes or until a toothpick inserted in the center comes out clean. Immediately loosen cake from the sides of pan and turn upside down onto a kitchen towel generously sprinkled with powdered sugar. Carefully remove the paper. Trim off stiff edges of the cake if necessary. While the cake ¡s hot, carefully roll the cake and towel from the narrow end into a cylinder. Cool on a cooling rack for at least 30 minutes. Unroll the cake and remove the towel. Beat jelly slightly with a fork to soften and spread over the cake. Roll up the cake. Sprinkle with powdered sugar. Cut into ½ inch slices to serve. If you do not have access to Meyer Lemons, you can use regular lemons. Because Meyer Lemons are larger, you will need more regular lemons to get 1 cup and more sugar because regular lemons are less sweet than Meyer. Put all the ingredients in a heavy saucepan. Turn the heat to medium and continuously whisk the mixture until it begins to thicken – it only takes a few minutes. Turn the heat down to medium-low and continue whisking. The lemon curd will thicken – all at once. Remove the pot from the heat and continue to stir with the whisk for one minute more. Pour into a clean container and let cool to room temperature. Jello molds from the 50’s and 60’s. Americans tend to eat the same thing when it comes to breakfast. The vast majority of us, surveys say, start our days with Starbucks or cold cereal — and those of us with children are more likely to buy the kinds of cereal with the most sugar. Children all over the world eat corn flakes and drink chocolate milk, of course, but in many places they also eat things that would strike the average American as strange. In England – eggs, sausage, bacon, beans and mushrooms. In Japan – miso soup, steamed white rice and pickles. While the benefits of eating breakfast are well-known — it can prevent weight gain, boost short-term memory, lower the risk of type 2 diabetes, and even make us happier — most of those health rewards depend on choosing the right foods. You want to aim for a breakfast that combines good carbs and fiber with some protein. Good choices include eggs, whole grains, fruit, peanut butter and yogurt. For a portable breakfast: Place in a ziplock bag: a cut up apple, 2 ounces of cheddar cheese cubes and ¼ cup of fiber and protein-rich walnuts. Instead of dousing a whole-grain toaster waffle in syrup, cut the sugar and boost the protein and fiber by spreading it with 2 tablespoons of peanut butter. Take a slice of crusty bread, spread it with 3 tablespoons of low-fat ricotta and add sliced plum tomatoes. Finish with a drizzle of olive oil (about 1 teaspoon) and a little salt and pepper. Place under the broiler for a minute or two. Slice a hard-boiled egg, then roll it in an 8-inch whole-wheat tortilla with a slice of lean ham and a slice of cheese. Add a tablespoon of salsa for a shot of flavor. In a small bowl, combine the first eight ingredients. Place a sausage slice in each of 24 greased miniature muffin cups. 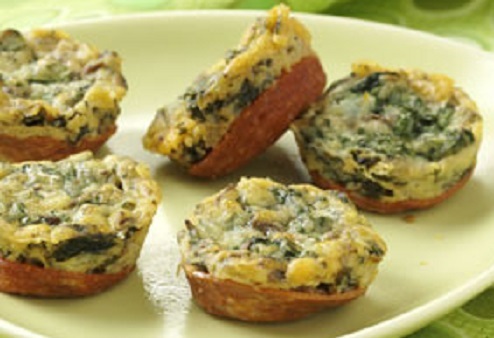 Fill muffin cups three-fourths full with the spinach mixture. Bake 20-25 minutes or until completely set. Carefully run a knife around the sides of the muffin cups to loosen the frittatas. Serve warm. Yield: 2 dozen. Combine the fruit and the 2 tablespoons of almond flour. Toss until well coated. Place in a 6” oven safe bowl leaving about 1 inch at the top for the crumble topping. Combine the remaining 1 teaspoon of almond meal, butter, oats, vanilla and cinnamon. Spoon over the fruit. 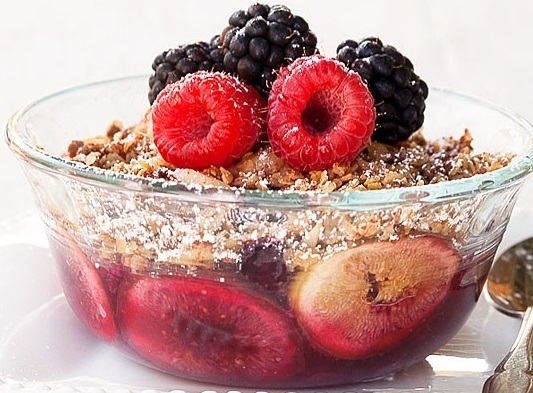 Garnish with almonds, additional fresh fruit and confectioners’ sugar. If crème fraîche is unavailable, use lightly sweetened sour cream. In a 2 1/2 to 3 quart pan over high heat, bring 3 cups water and the milk to a boil. Reduce heat so liquid is barely boiling. Stirring constantly, pour in polenta in a thin, steady stream, pausing occasionally to break up any lumps. Stir in sugar and salt. 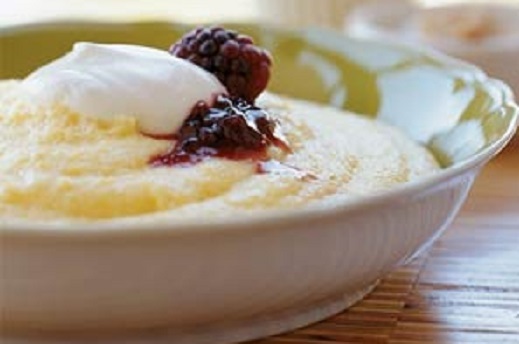 Simmer, stirring often, until polenta is soft and creamy to the bite, about 20 minutes (if heat is too high, bubbles may “spit” hot polenta out of the pan). Serve with a slice of baguette for dipping. In a wide, deep skillet, heat oil on medium. Add bell pepper, onion, oregano, coriander and cayenne and sauté, stirring frequently, for 4 minutes. Add garlic and sauté for 1 more minute. Add tomatoes, orange juice and 1/2 teaspoon salt. Stir to combine and increase heat to medium-high. Bring to a simmer and cook, stirring occasionally, until slightly thickened, about 4 minutes. Crack 1 egg into a small bowl or cup. Gently slip the egg into the sauce without breaking the egg; repeat with the remaining eggs, leaving 1-inch between each egg. Reduce heat to medium-low and sprinkle remaining salt ove rthe top. Cover and simmer gently until egg whites are opaque and yolks are firm, 6 to 8 minutes. 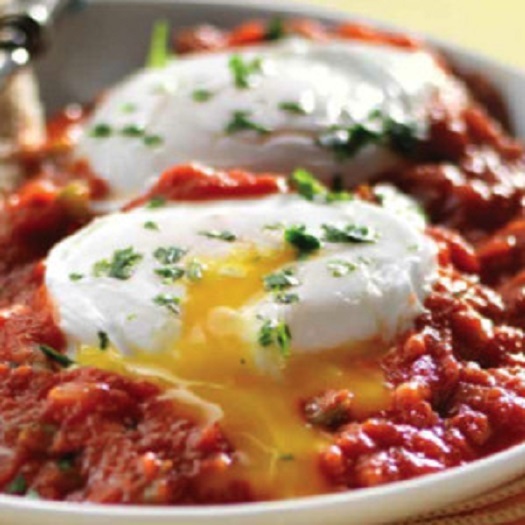 Carefully ladle sauce and eggs into serving bowls and top with chopped parsley. Makes 10-12 depending on the size of your muffin cups. Pre­heat oven to 400 degrees F.
Place all of the batter ingredients into a blender and pulse until smooth. 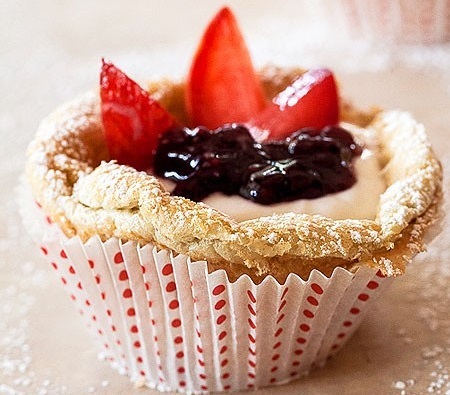 Pour batter into greased or lined muffin cups, filling half­way. Bake for 15 ­to 18 minutes or until puffy and brown. The pancakes will deflate when you remove them from the oven. Place a few sliced peaches on top of the pancake. Spoon on a tablespoon of yogurt followed by a teaspoon of jam. Decorate with berry slices, if desired. A sweet dough is filled with fruits, nuts and jam, almost like a Fig Newton. Making them is time-consuming, but the dough and filling can be made in stages and refrigerated for several days before the cookies are assembled and baked. Using a stand mixer and food processor takes some of the effort out of the process. Using an electric mixer with a paddle attachment, cream the sugar and shortening until light and fluffy. Add the egg, salt and vanilla extract. Mix until smooth. Sift the flour and baking powder together and then add them to the butter mixture. Mix well. Switch to the dough hook and knead at the low setting for 5 minutes, adding milk as needed to make a slightly sticky, soft textured dough. Turn the dough out onto a floured board. Divide the dough into four pieces, cover with plastic wrap and refrigerate for 45 minutes. Put the figs in the food processor and pulse until coarsely chopped. Stir in the honey, cinnamon, marmalade and walnuts. Take one piece of dough out of the refrigerator. Roll the dough out into a 12-inch square on a floured surface. Cut the dough into 2- by 3-inch rectangles. Spoon 1 teaspoon of filling into the center of the rectangle. Fold both of the longer edges toward the center of the cookie and pinch the seam together. Put the cookie, seam side down, on an ungreased baking sheet leaving 1 1/2 inches between cookies. Work in batches, keeping dough refrigerated until you’re ready to use it. Bake for 12 to 15 minutes, or until cookies are golden brown. Transfer to a wire rack to cool. Sprinkle with powdered sugar or ice the cookies after they cool with 2 cups of confectioners’ sugar mixed with just enough milk to make a smooth consistency. Makes about 3 dozen cookies. 1. Position 2 racks as close to the center of the oven as possible; preheat to 325°F. Line 2 baking sheets with parchment paper or nonstick baking mats. 2. Pulse nuts and sugar in a food processor until finely ground. Scrape into a large bowl. 3. Beat egg whites and salt in another large bowl with an electric mixer on high-speed until stiff peaks form. Using a rubber spatula, gently fold the egg whites into the nut mixture. Add vanilla and gently but thoroughly mix until combined. 4. Drop the batter by the tablespoon, 2 inches apart on the prepared baking sheets. 5. Bake the cookies until golden brown, switching the pans back to front and top to bottom halfway through, 25 to 30 minutes. Let cool on the baking sheets for 5 minutes. Gently transfer the cookies to a wire rack to cool completely. When the baking sheets are thoroughly cooled, repeat with the remaining batter. Lightly coat your hands with flour to make rolling the dough into balls easier. The dough freezes well. Freeze the dough after step 1, thaw in the refrigerator, then proceed with step 2. The powdered sugar-coating gives these cookies an appealing cracked finish. Serve with coffee to enhance the espresso. 1. Lightly spoon flour into a dry measuring cup; level with a knife. Combine flour, 3/4 cup powdered sugar, cocoa, baking powder, and salt in a medium bowl; stir with a whisk. Combine oil and chocolate in a small saucepan over low heat; heat until chocolate melts, stirring constantly. Add espresso granules to pan; stir until blended. Remove from heat. Pour chocolate mixture into a large bowl; cool 5 minutes. Stir in brown sugar, syrup, and vanilla. Add egg whites, stirring with a whisk. Add flour mixture to egg mixture, stirring gently just until combined. Cover; chill at least 2 hours or overnight. 3. Roll dough into 1-inch balls. Dredge balls in remaining 1/2 cup powdered sugar; place balls 2 inches apart on 2 baking sheets lined with parchment paper. Bake for 10 minutes or until tops are cracked and almost set. Cool cookies on pan 2 minutes; remove from pan. Cool cookies on a wire rack. Beat together the butter and sugar until light. Place sheets of parchment paper or silicone baking liners on two cookie pans. On a lightly floured counter or board, roll the dough into 1/2 inch balls. Using a blunt round object like the end of a wooden spoon, create an indentation in the center of each cookie. While still warm, use the spoon to redefine the circle, and then carefully spoon a little jam into each cookie. Let sit at room temperature until the jam is set. 2) In the bowl of an electric mixer, combine all ingredients and blend on medium speed until a soft, smooth dough forms, about 2 minutes. 3) Wrap and chill the dough for 1 hour. Towards the end of the chill time, preheat the oven to 350°F. 4) Drop tablespoon-sized dough balls onto the baking sheet. A teaspoon scoop makes this job easier. Bake the cookies for 8 to 10 minutes. The edges will be slightly browned and the cookies will be round and domed. 5) Cool the cookies completely. Prepare the icing by blending the softened butter and confectioners’ sugar. Add rum one tablespoon at a time until you have a spreadable icing. Top each cookie with a dollop of icing and a dash of nutmeg. Yield: Approximately 3 to 4 dozen cookies. In a medium bowl, stir together flour, cocoa powder, and salt; set aside. In a large mixing bowl, beat butter with an electric mixer on medium speed for 30 seconds. Add powdered sugar and vanilla. Beat until combined, scraping sides of bowl occasionally. Beat in egg. Beat in as much of the flour mixture as you can. Stir in any remaining flour mixture and the nuts by hand. Cover and chill dough about 1 hour or until dough is easy to handle. Shape dough into 3/4-inch balls. A level teaspoon cookie scoop works perfectly here. Roll balls in granulated sugar to coat. Place balls on ungreased cookie sheets. With the bottom of a glass, flatten balls to about 1-1/4-inch circles. Bake in the preheated oven for 6 to 8 minutes or until tops are just firm. Transfer cookies to a wire rack and let cool. Spread bottoms of half of the cookies with a rounded 1/2 teaspoon White Chocolate-Hazelnut Filling. Top with remaining cookies, bottom sides down. In a small saucepan, heat and stir 6 ounces chopped white chocolate and 3 tablespoons whipping cream over low heat until just melted. Remove from heat. Stir in 1/2 cup finely chopped toasted hazelnuts. Puglia is a flat, fertile, sun soaked region in southern Italy which, together with its iron rich soil makes it one of the most productive agricultural regions in the country. It is famous for its olive oil and produces between 250,000 and 300,000 tons each year. 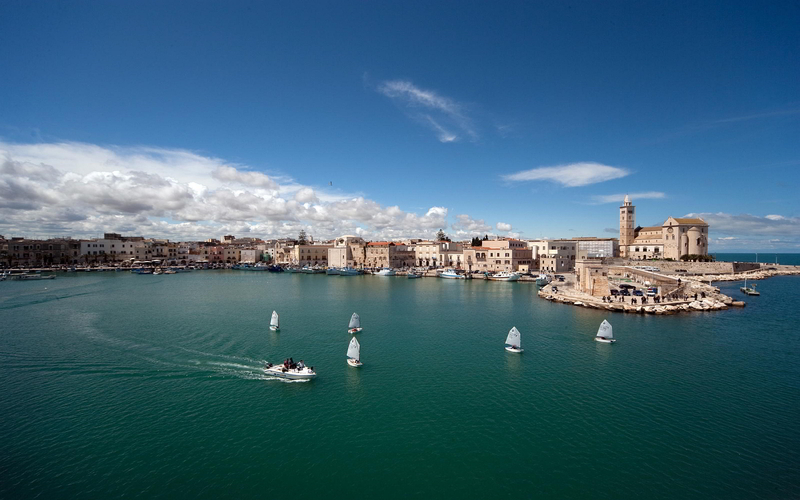 Puglia provides around 40 percent of the country’s extra virgin olive oil. Durum wheat grows in abundance and is used for making pasta and bread. The pasta from Puglia is made without eggs as they were once considered to be a luxury. The most famous pasta made in Puglia is ‘oricchiette’ (meaning little ears) which is still made daily by the elder women in most of the small villages. The bread in Puglia, which accompanies all meals, is more diverse than many other regions in Italy and comes in a variety of shapes and sizes. It is cooked in traditional wood burning bread ovens and some of the villages still have a communal bread oven where the locals go to bake their bread every day. Vegetables obviously grow well in the warm climate and are used in abundance, always fresh and always seasonal. Tomatoes are used for making sauces to go with the local pasta and aubergines, peppers and courgettes are roasted and grilled as an accompaniment to meat. 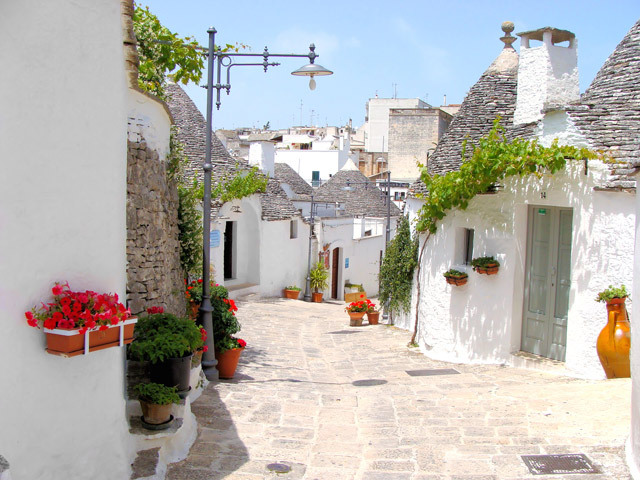 The interior of Puglia is rocky and many sheep and goats are bred there for their meat as well as their milk which is used for a variety of cheeses. Lamb is the most popular meat, followed by pork. Puglia has many delicious local cheeses, perhaps the most famous being Burrata which is made from mozzarella and cream. Others include Cacioricotta – a seasonal Ricotta cheese made from unpasteurized ewes’ milk, Canestrato – a hard cheese which is a mixture of sheep and goat’s milk, Fallone di Gravina and Caciofiore. Fish plays a large part in the cuisine of Puglia and the long coastline offers a large array of fresh fish on a daily basis. Sea bass, red mullet, anchovies, mussels and cuttlefish are among the favorites. In spite of this excess of food, the daily cuisine in Puglia, as in the other southern regions of Italy, tends to be simple, fresh and wholesome with most locals growing, rearing and making enough for their individual needs. Place the peppers in a hot oven (400 degrees F) for about half an hour or under the broiler until the skins start to blacken. Take them out of the oven, cool and then peel off the skins. Cut the peppers into strips, about 2 inches wide. 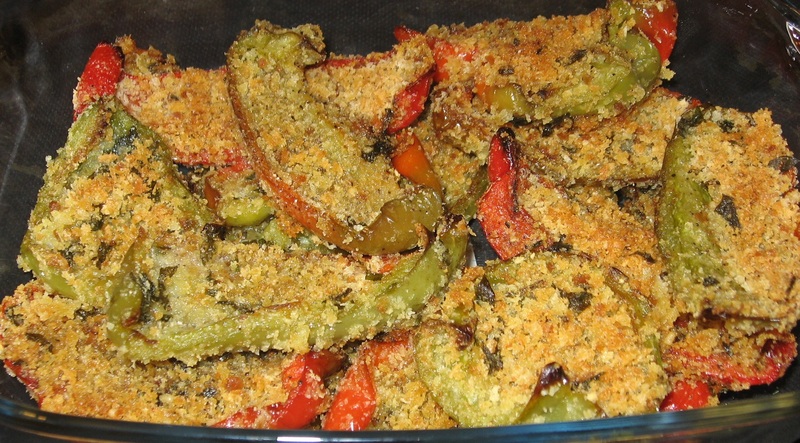 Grease the bottom of a baking pan with olive oil and place a layer of peppers. Sprinkle a few capers, a few slices of garlic, some of the chopped anchovy fillets, a sprinkle of bread crumbs and a little salt and pepper on the peppers. Repeat the layers until all the ingredients are used. When the top layer is finished, drizzle with olive oil. Then place the pan in a 400 degree F oven for about 15-20 minutes or until the peppers are tender and the bread crumbs are brown. Combine the all the ingredients in the bowl of an electric mixer with the paddle attachment and mix until thoroughly combined. Switch to the dough hook and knead the dough for a few minutes. Soften the dough by adding a little warm water, if it seems too dry. Turn the dough out onto a bread board and roll pieces of the dough into long thin stripes about 4-5 inches long. Loop the ends around to form circles or pretzel shapes and space them out on wax paper to rest for to rise for 15 minutes covered with a clean kitchen cloth. 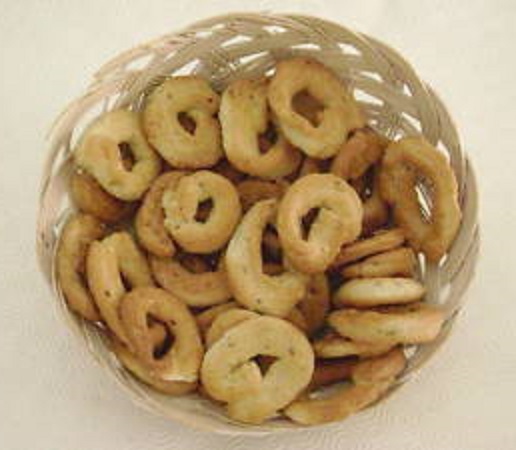 Bring water to a boil in a large saucepan and drop a few of the taralli in the boiling water for a minute, turn with and cook another minute. Remove the boiled taralli with a slotted spoon to a wire rack to dry for a minute or two. Place them on an oiled baking sheet and bake for about 15-20 minutes, until brown and crispy. Cool completely. Wash the mussels well under running water and pull out the beards (the stringy bits hanging out of the shell) and place them in a bowl of cold water. Heat a large pot of water for the pasta and when it comes to the boil add salt and the pasta tubes. While the pasta is cooking, heat the olive oil in a large skillet with a cover and add the chopped garlic. Cook for a minute and add the cherry tomatoes. Once they soften, add the white wine and bring to a boil so the alcohol evaporates. Season with salt and the crushed red pepper and add the mussels. Cover with the lid and cook until all the mussels open. Reserve ½ cup of the pasta cooking liquid and drain the pasta. 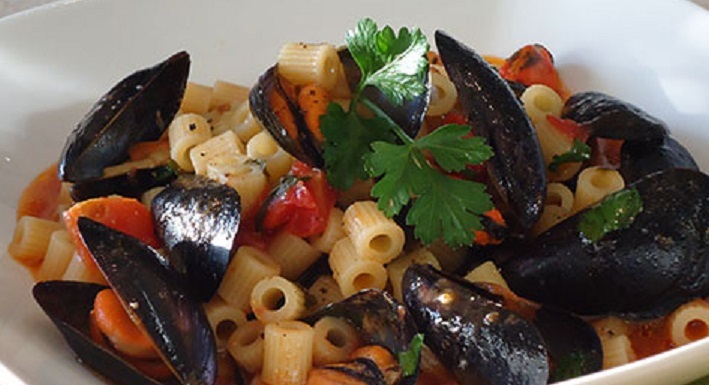 Add the pasta to the mussels in the skillet, along with the chopped parsley and reserves pasta cooking liquid. Mix well on a low heat for a minute and serve. Boil wine in a medium saucepan until reduced to 1 cup, about 5 minutes. Remove from heat and reserve. Generously brush an 18 x 12 x 1 inch baking sheet with olive oil. 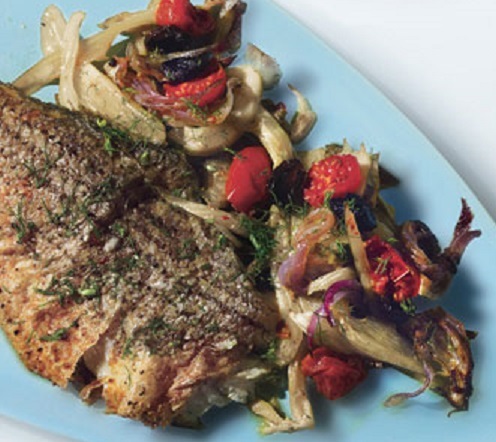 Arrange fennel slices in a single layer on the prepared baking sheet. Top with onion slices in single layer. Sprinkle with salt and freshly ground black pepper. Drizzle 3 tablespoons oil over the vegetables. Rinse fish inside and out and pat dry with paper towels. Sprinkle fish inside and out with salt and freshly ground black pepper. Lightly dust outside of fish with flour. Pour enough olive oil into extra-large skillet to cover the bottom of the pan; heat over medium-high heat until pan is very hot. Working with one fish at a time, add fish to the skillet and cook until a golden crust forms on the skin, about 3 minutes per side. Repeat with remaining fish. Add more oil, only if necessary.Carefully place fish on top of the vegetables on the baking sheet. Gently stuff the cavity of each fish with 2 crushed garlic cloves and then 1/4 cup chopped parsley. Pour reserved wine over vegetables on the baking sheet. Roast fish uncovered until vegetables begin to soften, 35 to 40 minutes. Scatter tomato halves and olives around the fish; bake until fish is just cooked through, about 15 minutes longer. Transfer fish to large platter; cover with foil to keep warm. Increase oven temperature to 475°F. Continue to bake vegetables uncovered until tender and tomatoes are very soft and beginning to color in spots, about 15 minutes more. Arrange vegetable mixture around the fish on a serving platter. Sprinkle chopped fennel fronds and serve. In a heavy saucepan, heat the water. Add the butter and the salt and remove from the stove once the butter has melted. Add the flour all at once. Beat with a wooden spoon. Return the pan to medium heat and beat the mixture until it forms a ball. Remove the pan from the heat again. Add the eggs in one at a time, beating the dough with a wooden spoon or hand mixer. Note – make sure to blend in each egg well before proceeding to add in the next one. Drop 1 1/4-inch portions of dough about 1/2 inch apart on the prepared cookie sheet. Bake the puffs about 15 minutes at 400 degrees F and then for 10 minutes at 375 degrees. Transfer the pastries to cooling racks. In a medium bowl, mix the cornstarch and sugar for the filing. Set aside. In a medium saucepan, heat the milk over medium-high heat until it’s almost boiling. Add the 6 eggs to the sugar and the cornstarch and gradually add a couple of large spoonfuls of the warm milk. When it’s well-blended, pour it into the pot with the rest of the milk and continue to cook until the mixture thickens. Use a small knife to cut each zeppole in half. Fill each zeppole with some custard, replace the top half and put the zeppole on a serving dish. 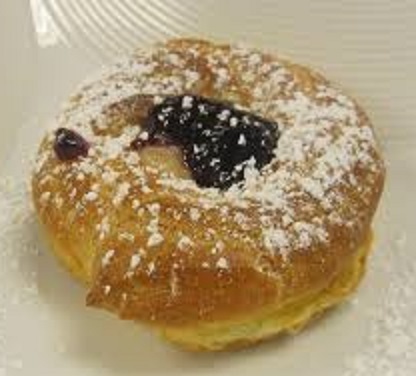 Add a teaspoon of jam to each zeppole and dust them with confectioner’s sugar.